Si Zhu (絲竹) in Chinese refers to silk and bamboo, the materials used in the main instruments in this genre of music. Jiangnan Si Zhu is silk and bamboo ensemble music from the Jiangnan area of China. 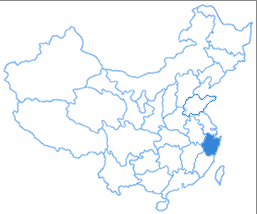 Jiangnan refers to the area south of the YangTze River, and encompasses the Shanghai Municipality, the southern part of Jiangsu Province, the southern part of Anhui Province, the northern part of Jiangxi Province, and the northern part of Zhejiang Province. Jiangnan Si Zhu music began to flourish in Shanghai after the revolution of 1911. Many local groups performing the music were formed. Each ensemble can be made up of as little as 3 to 5 musicians, but is usually in the range of about 7 - 8 performers. The instruments usually found in such an ensemble are the erhu (二胡), small sanxian (小三弦), pipa (琵琶), yangqin (揚琴), dizi (笛子), xiao (蕭), drums (鼓), wooden block (板), temple blocks (木魚), and some other forms of percussion instruments. Like many Chinese folk instrumental music, most of the pieces are based on a single or a few melodies or qu pai (曲牌) and variations are added on as the piece progresses. Variations here are somewhat different from the type of variations in Western Classical Music. With the main melody, a few different variation techniques can be found: in a slow tempo with plenty of added ornaments to the main skeletal structure of the melody; with increasing tempo, notes are taken away and the melody revolves with fixed repeated motifs upon the basic melodic skeleton. Different rhythmic patterns may also be used, while the basic notes remain the same. Another variation technique used is also by changing the time, from a rhythmically free time, to a duple, to a quadruple, octuple and single beat time. An example of how the melody varies can be seen below. These are all variations from the first melody. Below are some examples of Jiangnan Si Zhu music. Zhou Qing Qing. Zhong Guo Min Jian Yin Yue Gai Lun "中國民間音樂概論". Beijing: Renmin Yin Yue Chu Ban She, 2002. Cheng Tian Jian (ed.). Zhong Guo Min Zu Yin Yue Gai Lun "中國民族音樂概論". Shanghai: Shanghai Yin Yue Xue Yuan Chu Ban She, 2003. Wang Yao Hua, Chen Xin Feng, Huang Shao Mei (eds.). Zhong Guo Min Zu Min Jian Yin Yue "中國民族民間音樂". Fuzhou: Fu Jian Jiao Yu Chu Ban She, 2006.